The Brooklyn Museum marks the five-year anniversary of September 11, 2001, with an exhibition of works from the permanent collection that includes paintings, photographs, prints, and drawings of the Lower Manhattan area around the World Trade Center site before, as well as after, the attack. 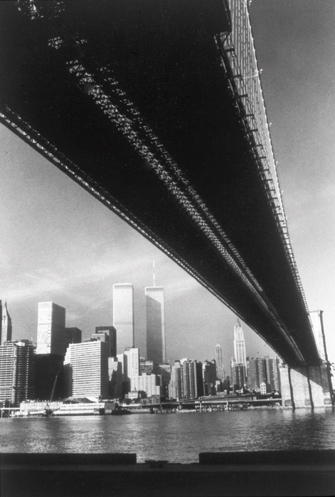 Among them are a late eighteenth-century print of the southern tip of Manhattan island, a number of photographs of the area in the 1930s by photographer Berenice Abbott, a large-scale photograph by Gerard Maynard, titled WTC 11.11.03, as well as Christoph Draeger’s WTC September 17, and a number of photographs by G.N. Miller, an artist who spent several weeks at Ground Zero following the disaster. Several books by artists are also on view, including the work of Art Spiegelman and Mimi Gross. These books, providing poignant text and images, offer insight into the calamitous event and the national and international issues related to its aftermath. Looking Back from Ground Zero: Images from the Brooklyn Museum Collection is co-organized by Marilyn Kushner, Curator of Prints and Drawings and Deirdre E. Lawrence, Principal Librarian/Coordinator of Research Services at the Brooklyn Museum. with additional support from Bob Buckholz and Lizanne Fontaine and other generous contributors. The following audio file contains excerpts from interviews with the exhibition’s co-curators, Curator of Prints and Drawings Marilyn Kushner and Principal Librarian Deirdre Lawrence.